Alton is one of our longest-term dogs available at the shelter. Because the shelter is currently full, staff have placed Alton on *urgent* status. Alton is a sweet, cuddly and beautiful boy who's learned a lot in his BAD RAP classes. This is Adorable Alton's hour of need. Our Alton is one pretty boy! From his clear, wide set hazel eyes, to his pink spotted nose, to the cute merle patches in his coat, he's pretty much a highlight reel of irresistible features. Alton is a cuddly and sweet pup. The shelter has been a university for him where he's learned leash manners, how to be unreactive to other dogs and better yet, how to play with almost any dog. He's a great fetcher who loves to burn off some energy by playing ball before settling down into a nice walk. His adopter will be able to continue his training for free with weekly classes with BADRAP.org. 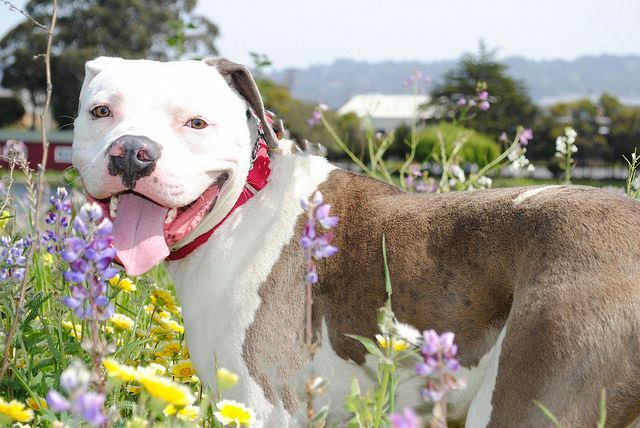 Come down to Berkeley Animal Care Services to be charmed by this scrumptious pup in person!